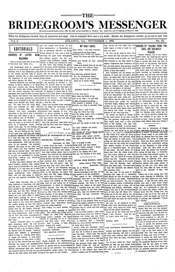 Bridegroom's Messenger, a prominent early Pentecostal periodical, was first published in 1907 by evangelist G. B. Cashwell. Cashwell, along with A. G. Garr, Charles H. Mason, D. J. Young, and others, brought the Pentecostal message from the Azusa Street revival in Los Angeles to the southeastern United States. Elizabeth A. Sexton succeeded Cashwell as editor in 1908. Contributing editors included leaders of what would become the Church of God (Cleveland, TN), the International Pentecostal Holiness Church, and the Pentecostal Free Will Baptist Church. Early issues of Bridegroom's Messenger are an important source for information about the development of Pentecostalism in the Southeast and beyond. The periodical included articles and letters from its broad readership, and also published reports about two leading Atlanta Pentecostal institutions - the Pentecostal Mission and Beulah Heights Bible Institute. Hattie M. Barth, who with her husband co-pastored the Pentecostal Mission, became editor in 1924. Under her leadership, Bridegroom's Messenger became the official organ of the Association of Pentecostal Assemblies (APA), a small fellowship organized in 1921 by Pentecostal churches in the Southeast. The APA merged with the International Pentecostal Church in 1936. The new organization, named the International Pentecostal Assemblies (IPA), merged with the Pentecostal Church of Christ and became the International Pentecostal Church of Christ (IPCC) in 1976. Bridegroom's Messenger served as the official organ of both the IPA and IPCC. Bridegroom's Messenger continued publication until 1996, when it was succeeded by The Pentecostal Leader. The IPCC, with U.S. headquarters in London, Ohio, reported 4,961 adherents in 67 churches in 2003. Outside the U.S., the IPPC claims 539 churches and ?? adherents. For more information, visit the IPCC website: www.ipcc.cc. Some issues of Bridegroom's Messenger have not yet been located. If you possess issues that are not on this website, please contact the Flower Pentecostal Heritage Center at archives@ag.org.